According to the first BMO Housing Confidence Report, nearly half of Canadian homeowners (46 per cent) intend to buy a property in the next five years, signalling a high level of confidence in Canada’s housing market. A modest increase in prices, however, would derail plans to buy; meanwhile, three-quarters (72 per cent) of households would feel a significant strain if they were to experience a modest increase in monthly mortgage payments, such as one caused by an increase in interest rates. Furthermore, Mr. Nel added that choosing a fixed rate mortgage and a lower amortization period can help Canadian households to increase financial stability. This echoed an earlier report by BMO Economics which noted that financial stability for Canadian homeowners in the coming years will be supported by locking-in to fixed rate mortgages and opting for shortened amortization periods. “Given that Vancouver is one of the priciest markets in the world, it’s not surprising that many people expect some correction,” said Mr. Guatieri. He added that while prices in Alberta should increase in the years ahead, prices in Vancouver and likely Toronto are poised to decline moderately; the Toronto decrease is contrary to the expectations of the majority of residents in the GTA. 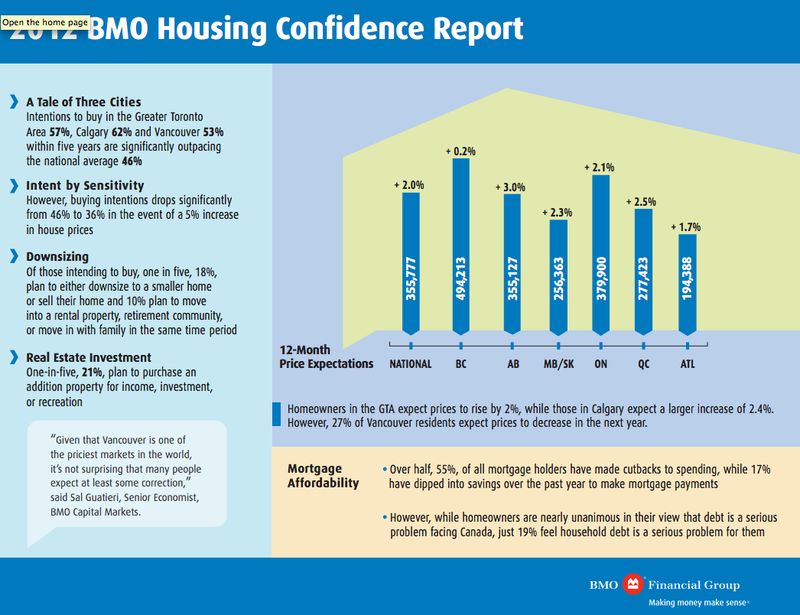 The BMO Housing Confidence Report was conducted by Pollara. Survey results cited in this report are from online interviews with a random sample of 1,011 Canadian homeowners, 18 years of age and over, conducted between September 13 to September 21, 2012. A probability sample of this size would yield results accurate to ± 3.1 per cent, 19 times out of 20. Data has been weighted by region, based on the most recent Census figures, so that it is representative of Canadian homeowners.